Fill out this form and we will send your friend an email with a link to DB2 Racing. A racing game with guns. 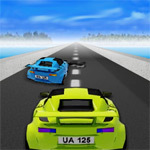 Drive your car and shoot the enemies. Crees poder manejar durante 90 segundos ante un tráfico loco?